Microplastics can be found in almost every ecosystem, in water, air and soil. Nevertheless, there is a lack of precise knowledge about the actual quantities and their distribution. The reason for this lies in the similarity of the chemical composition of microplastics and the naturally occurring organic compounds as well as in the relatively small mass fraction in the sub-percentage range. At present, there is no non-destructive method available that can guarantee the rapid estimation of the microplastic content in a natural matrix to the extent required. Thermogravimetric methods such as TED-GC-MS allow quantification with a good throughput but have the disadvantage that only very small sample quantities can be examined. 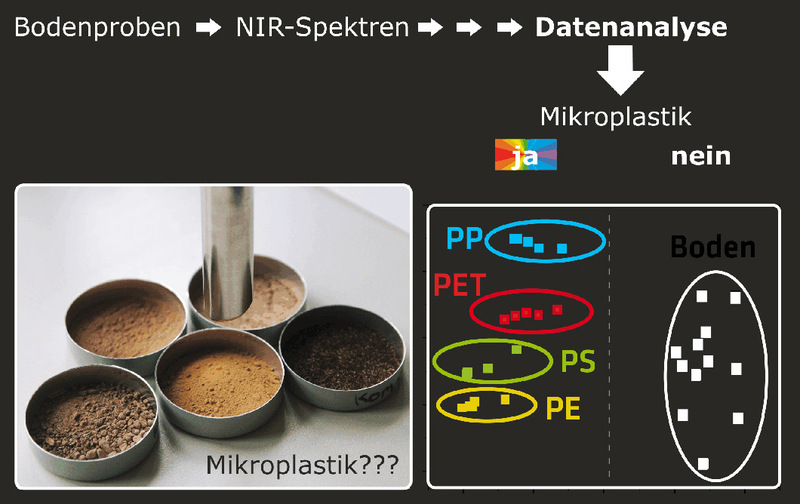 Micro- infrared and micro-Raman-based methods are used for the investigation and quantification of microplastics and provide detailed information on number, size, shape, polymer type and degree of ageing of microplastics, but are very time-consuming regarding enrichment, preparation and evaluation. As part of our work, we present a near-infrared based method which, using a process spectrometer with fiber optic reflection probe, allows the examination of soil samples on a gram scale within a few minutes with minimal pre-treatment (homogenization, drying). The centerpiece of this method is the multivariate analysis of the obtained spectral information. In a hierarchical approach, a first chemometric model is used to test whether a soil sample contains microplastics or not. A second model can then be used to search for the most common plastics such as polyethylene (PE), polypropylene (PP), polystyrene (PS) and polyethylene terephthalate (PET). While the evaluation of new samples is possible immediately after the measurement, the calibration of the models requires more time. For the training of the chemometric models, a BAM reference material well as other microplastic soil mixtures produced gravimetrically using the plastic particles <125 µm were used. As a result of this work, microplastic contents of up to 0.5 % were detected in both microplastic-spiked standard soil samples and real-world samples, e.g. compost, fermenter residue and unknown soils. Moreover, the majority of the contained polymers were identified correctly.